I’ve always felt that the New Adventures conference has always held a special kind of legacy in the digital design world. Amongst many of the designers I look up to, attendance at one of the original trio of events between 2011 and 2013 seemed to serve as a badge of honour and even became a catalyst to their development. When it was announced last year that New Adventures would be returning to Nottingham’s beautiful Albert Hall, I felt it was an opportunity not to be missed and snapped up a ticket on the first day. New Adventures was nothing like that. Not long into the first talk, it was a great relief when Jeremy Keith of prestigious UK design consultants Clear Left announced to the audience that it is in fact difficult to stay on top of the newer, fast-moving, technologies and not to feel bad for being overwhelmed by it all. Having a solid understanding of HTML and CSS is itself a noble skillset and you can do a lot of good work with it. For any readers about to jump ship because I’m going to carp on about programming languages, fear not. New Adventures extended far beyond the technical side of web design, in fact there was very little code on show all day. Instead the focus lay subjects such as ethics, diversity and inclusivity within our industry. Importantly, the key message was to take responsibility to use your position as a digital designer to help people and make the web a better place. Clare Sutcliffe MBE talking about Code Club. A perfect example of someone doing this was the mornings second speaker, Clare Sutcliffe MBE, co-founder of Code Club, the (now global) initiative teaching primary school children how to code. I have a very vague memory is sending Clare a message of support on a long defunct Twitter account when Code Club first launched in 2012 and seeing how it’s grown into this huge positive force since then (there’s now over 12,000 code clubs around the world!) was really kind of mind blowing. Mind blowing enough that I decided to sign up as a Code Club volunteer during the tea break, hurrah! Later, Ashley Baxter talked about her experiences setting up and running her company With Jack, which provides business insurance for freelancers. This talk was especially useful to me as a small business owner (I certainly made the most notes here!) as Ashley explained how to make positive, personal connections with your customers and to look at things from their point of view. Crucially, Ashley also spoke about the importance of not over engineering your website (or product or business). Start small and evolve over time based on the customer feedback. This sentiment was echoed by several of the speakers throughout the day. Josh Brewer (formerly the principal designer of Twitter) spoke of not being afraid to put work out there and learning from failure. Likewise, Brendan Dawes spoke of refining your designs over time and embracing your mistakes. Jess White gave an interesting talk on designs and developers working together. 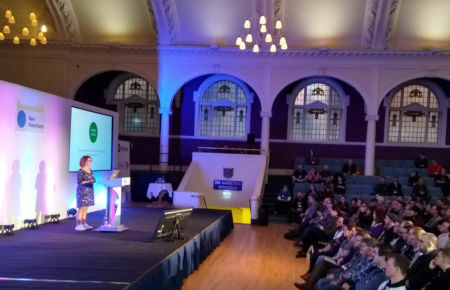 Jessica White, developer and director of the DDD East Midlands Conference, pointed out that a website at launch should be viewed as a baseline (rather than the finished product) and then developed further to add more value over time based on the user feedback. Side note: This is basically how I want to run my business but have never been able to express it quite so coherently before! This theme was perfectly summed up by Naz Hamid, founder of the American digital studio Weightshift, simply saying “Progress over Perfection”. Extending this beyond our work, he spoke of improving the way we should work; creating teams of more diverse people to improve innovation and building empathy with those around us. Helen Joy, UX consultant at Sparck, talked about Inclusive Design; Making content on the web accessible to all people. 11 million in the UK do not have basic digital skills, such as being able to send an email or use a search engine. This is something that is easy to take for granted and the phrase Digital Privilege summed it up well. Accessibility can also be affected by external factors such as your location, income and mental health. Helen shared a whole bunch of useful resources on this subject including the Ethical OS Toolkit as well as The Copenhagen Letter; a pledge to take responsibility for the digital world we are building. The conference was closed by Ethan Marcotte, who gave a passionate talk about the current state of the digital design industry which was not afraid to acknowledge head on that the internet and the world at large is a darker place than it used to be. He spoke of designing with hope and ethical values at the core of everything we do. He urged us to fight back against the continuing rise of automisation, putting people over profit before the digital world is completely consumed by industrialisation. It was a rallying call that fired up the audience and it was a special moment that felt like the start of something. In the conference guide, event organisers Simon Collison and Geri Coady said they thought bringing back New Adventures might play a role in re-energising digital design and could be a positive response to an uncertain future (even the illustration on the cover showed an ostrich lifting it’s head from the sand). In that regard I think it has been a resounding success. One of the most emphatic messages was “Let’s do better” and I left New Adventures 2019 feeling that I can.